I post a lot of breakfast recipes because I have breakfast problems. I like to eat it, but I’m a pickypants about traditional breakfast foods: I don’t like eggs, I only eat oatmeal under select circumstances, and the yeast in bread gives me bellyaches. In the winter, it seems too cold for yogurt, my usual breakfast staple, so I do a lot of breakfast baking. These muffins are made with granola right in the batter. 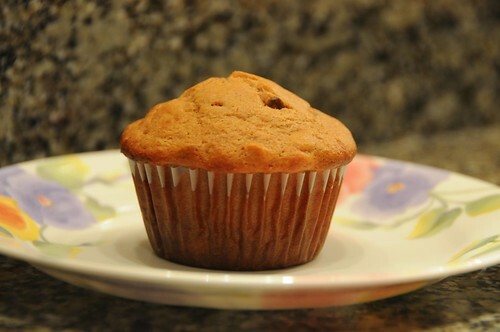 The granola is softened by soaking it in milk before adding it to the muffin batter, and the resulting muffins are very moist and only slightly sweet. 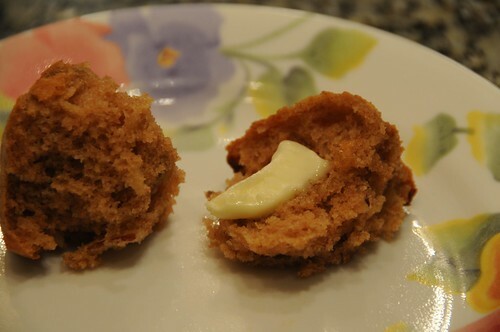 Like many muffins, I like these best split and buttered; I often put mine in the toaster oven in the morning to help get them to a butter-melting temperature. Preheat the oven to 375 F. Grease or line twelve muffin cups. 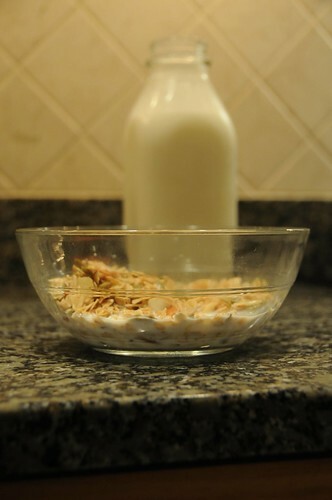 Put the granola in a bowl, pour the milk over it, and let soak for at least 20 minutes. Mix together the eggs, honey, yogurt or sour cream, canola oil, and vanilla. Add the dry ingredients (flour, baking powder, baking soda, salt) and stir just to combine, then fold in the granola. Fill the muffin cups about 3/4 full and bake the muffins for 22-25 minutes, or until a toothpick comes out clean. Because they are so moist, it’s a good idea to let them cool for ten or fifteen minutes before removing them from the pan, especially if you’re not using liners. *I think any granola would work here. I used the stuff I make myself, which starts off pretty chewy. If you use a really crunchy store granola, you might want to soak it a little longer.